Booking on ebookers.com, I managed to get the cheapest roundtrip to the US ever. Paying NOK 1850 (Eur 225), and additional tax got this ticket down to the fenomenal low price of 175 Euro. And this, on in my mind the best and most comfortable crossing from Europe to the US. On Icelandair from Oslo to Reykjavik, and then on to Boston. For those of you, struggling on long crossings over the Atlantic, you effectively cut the trip into two, allowing you to have a stretch on your legs at Keflavik airport. And the trip from Reykjavik takes around 5 hours and 30 minutes. On time the whole way. Departure from Oslo at 11.55 AM (CET), arriving in Reykjavik at 4 PM (GMT), as we had picked up passengers in Stockholm. Departure from Reykjavik 5 PM (GMT) arriving in Boston 30 minutes before schedule at 5,20 PM (EST). A great smooth trip. 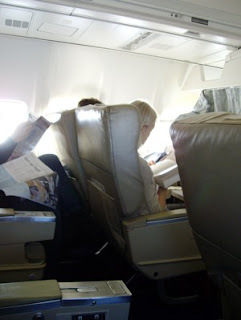 Icelandair use smaller, and more comfortable Boeing 757 airplanes and it does not cut down the number of staff on board. Thus, service to the customers is very good, an you do not have to wait long to be served. On economy class most softdrinks are comlementary,but you have to pay for wine and hard liquor. That does not matter, however. They provide it on a nice price. Paying EUR 3,50 for a bottle of wine is not much. Should you decide to order a gin and tonic, however, you will have to pay EUR 5. It is always great to be served warm food on a long trip. Icelandair brings you back to the good old days in that respect. Lunch from Oslo to Reykjavik was a warm schnitzel filled with ham and cheese, served with rice and vegetables. Served with rolls and butter and a chocolate for dessert. Good, as airline food goes (BBBB). The wine served, a Lehmann wine, produced in Australia, was not very good. Very flat and much to dry for my taste (BB). On the atlantic crossing, we were served either fish, or lasagne. I chose the lasagne with vegetables, and it was accompanied by, rolls with butter, a crab salad and a slice of apple tart. The lasagna was steamed more than baked, with hardly no cheese at the top. It tasted a little flat in my mind. The crab salad (crabmeat mixed with mayonnaise) was very good. (BBB) And the same wine again. So in danger of being picky, only three Bs out of five. But in spite of this, it is still great to be well fed on a trip, and we did not leave hungry. The best way to cross the pond, and you are well taken care of. Recommended!! !